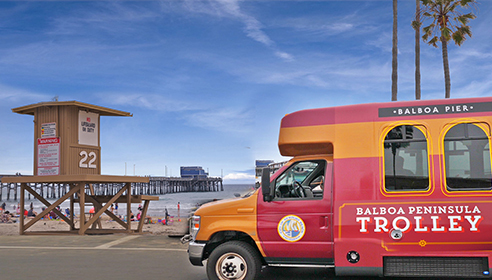 The Balboa Peninsula Trolley is a free service to get you easily moving around the Peninsula without having to pay for parking or worry about finding a place to park. The trolley route has been slightly modified this year. The first stop is located next to the Avon Street Parking Lot near the intersection of Tustin Avenue and Avon Street within Mariners’ Mile. Trolley drivers will provide riders with a code for use with the “ParkMobile” App to cover the cost of parking in the lot. The first stop is located next to the Avon Street Parking Lot near the intersection of Tustin Avenue and Avon Street within Mariner’s Mile. Trolley drivers will provide riders with a code for use with the “ParkMobile” App to cover the cost of parking in the lot. Exit at Short to experience Lido Marina Village. Artisans, tastemakers, chefs, curators and collectors come together to share their wares and draw inspiration from the sun and the sea. 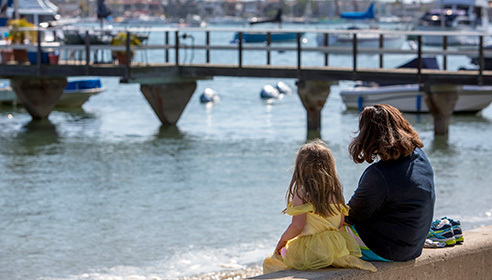 Enjoy al fresco dining waterside, explore a mix of charming boutiques and stylish shops, and experience a delightfully scaled village ambience inviting you to stroll and discover creative details at every turn. 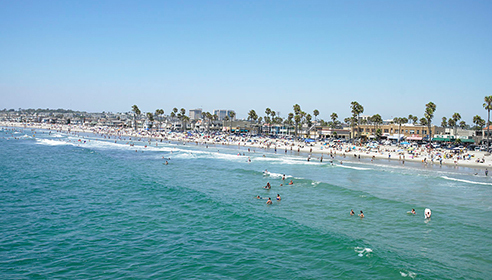 This is Newport Beach at its best…casual, comfortable and chic in equal measure! Topside roof deck bar, and event space. At this stop you will find a plethora of restaurants & bars to satisfy any hunger needs. It’s a great grab-and-go spot to hit before you venture to the sand. In addition to the places listed below, you will find the following nearby: Bliss Paddle Yoga, Laventina’s Big Cheese Pizza, and Pavilions Supermarket. Plenty to see here! This stop will place you in the midst of the action. 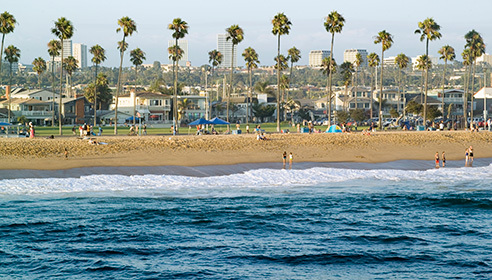 Right near the Newport Pier and adjacent to so many iconic Newport Beach restaurants and shops, this trolley stop is a popular one amongst visitors and residents alike. You will also find the following businesses and restaurants nearby this stop: Banzai Bowls, Dory Deli, Blue Beet, Blackie’s, Beach Ball, Seaside Donuts Bakery, TK Burger, Dory Fishing Fleet Market, Jane’s Corndog, and a 7 Eleven. 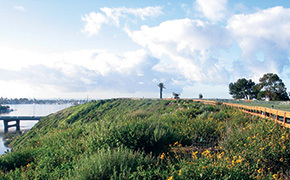 Marina Park is an exciting and cutting-edge community and sailing center. 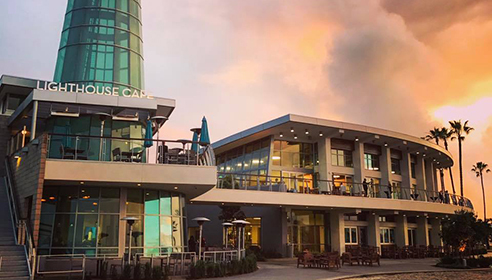 Amenities include a ten-acre park, nautical-themed playground, facility rental, outdoor fitness circuit and basketball courts, Lighthouse Bayview Café, catering, and picnic area. 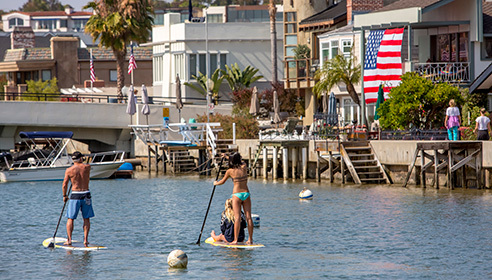 Stand-up paddle boards and kayaks are also available for rent. 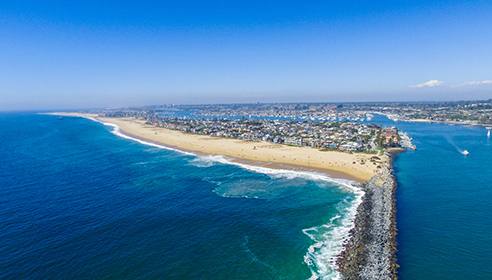 Come to this stop dressed in swim attire and loaded with beach gear, as it’s located steps from the harbor and a short stroll to the ocean waves. 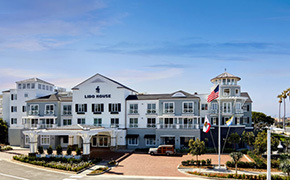 Here’s another perfect spot to hop off the trolley and take in that ocean air! 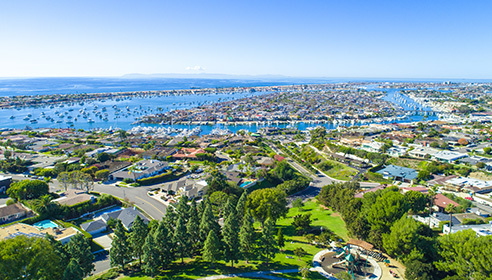 Near this stop you will find the following: Our Lady of Mount Carmel, Christ Church by the Sea, Newport Elementary School, and Fry’s Market and Rentals. 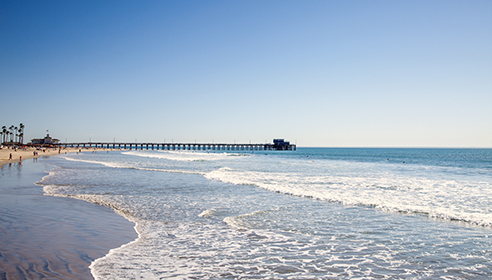 Hop right onto the boardwalk from this location or find a quiet spot on the beach! Looking for a place to spread out and park your beach chair for the day? Stop right here! Balboa & 8th is a great location for all beachgoers. Just a short distance away, between 9th and 10th, trolley passengers will find a calm beach alongside the harbor that’s great for sand toys and kids. There are also lots of great spaces to settle into on the ocean-facing side. 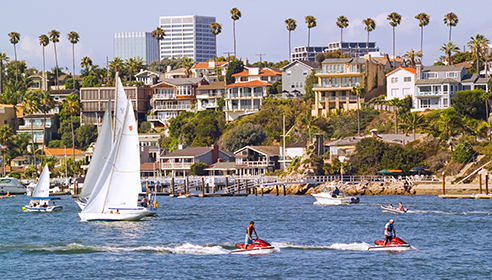 Near this stop, you will find the Newport Harbor Yacht Club. Balboa Branch Library, Balboa Barbor Shop. This trolley stop unloads just before you’ll hit the bustle of the Balboa Pier. It’s the ideal stop for anyone seeking out boat rentals, bike rentals or tickets for a whale watching excursion. 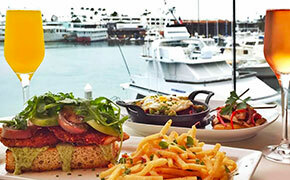 It’ll also drop you in the midst of a few of the Balboa Peninsula’s popular dining locations. 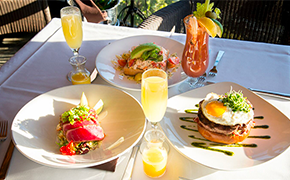 In addition to the places listed below, you will find these fine establishments near this stop: Azar’s Gourmet Pizza, Bal Harbor Liquor & Deli, Class of 47, Jane’s Corndogs, , The Mermaid Coffee Bar. This is one of the most popular stops for all ages! The Balboa Pavilion & Fun Zone offers a variety of excitement, including a Ferris wheel, arcade games, and Discovery Cube’s OceanQuest. So much to see and do at this trolley stop! 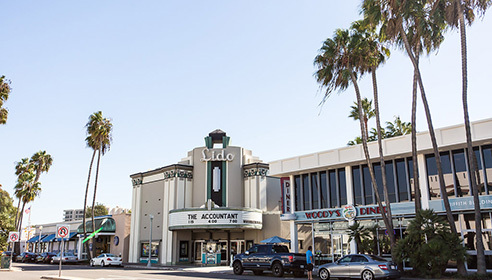 In addition to the places below, you can also find the following near this stop: Corner of Paradise, Great Mex, Cruiser’s Pizza, BJ’s , Cabo Cantina, Balboa Pharmacy, Mint Leaf Thai Cuisine , Balboa Saloon. In search of that perfect beach read? This trolley stop was built to satisfy your inner bookworm. Make a visit for a quick read before you head out to the sand. The following places can be found near this stop, as well: Balboa Branch Library, Lombardy’s Market & Deli, Balboa Barbor Shop. A cluster of restaurants, bars, and surf shops, trolley passengers will find whatever it is they need and more at the Newport & 28th stop! 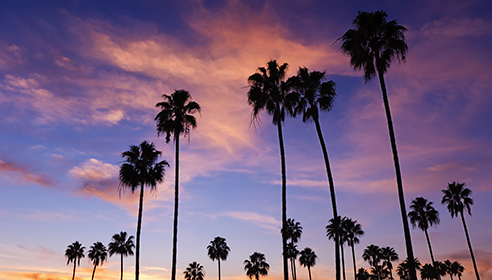 In addition to the great places listed below, you’ll also find these places near this stop: Subway, Citi Donut, Jack’s Surfboards, Avila’s El Ranchito, American Junkie. 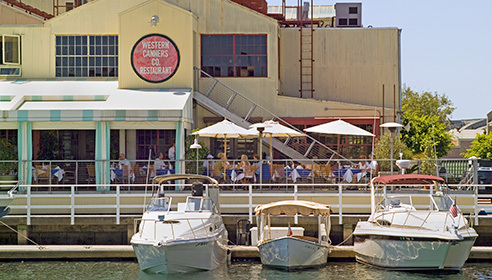 Hop right off the trolley and enjoy nearby restaurants and harbor views! 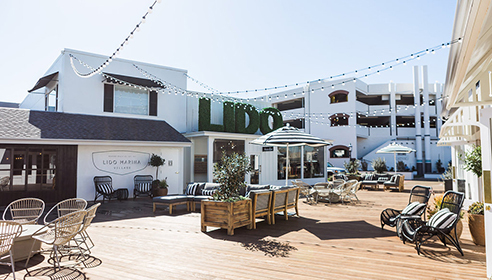 Lido Marina Village is one of Newport’s newest shopping destinations. From contemporary fashion to world-renowned restaurants, this prized village is a sight to see. 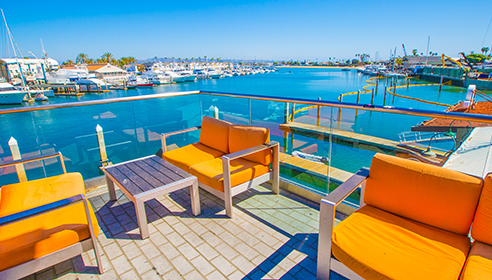 The ambiance provides a great location for strolling the waters edge, seeking out stylish shops and enjoying a sunny day in Newport Beach. 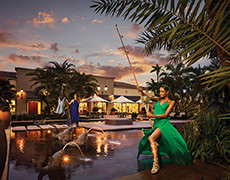 Aside from the excellent restaurants listed below, near this stop you will also find Lido Theater, Via Lido Books & Drug Store, Starbucks Coffee, as well as the Shops at Lido Marina Village. 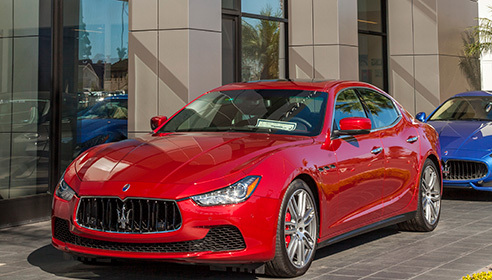 Located near Mariner’s Mile, the automotive and nautical heart of Newport Beach beats on this stretch of Pacific Coast Highway and is home to million-dollar yachts, luxury cars and some great dining!